No textbooks are needed, grab a basketball and team up with Sport Court to jump start your kids' physical education this school year! A game court from Sport Court helps provide the best environment to keep your kids active in their physical education. Not only is it a convenience to have one at your home, it will also help excel your child's performance in school. Children learn valuable life lessons when playing sports, like how to work together in a team and make friends in school. Physical exercise helps promote a healthy life style, is a great stress reliever, and reduces depression. Research has also shown that girls that play sports at an early age are more likely to have a positive body image and higher self-esteem. Your child can practice their math skills while tallying up the score and stats of each player in the game. Strategic thinking is also developed when your child is analyzing which move they should make to avoid defensive players and vice versa. Playing sports teaches children respect and discipline as well. If they lose, they learn how to congratulate their opponent instead of stopping off as a sore loser. They learn the rules of the game and the proper way to play instead of using inappropriate actions and gestures. 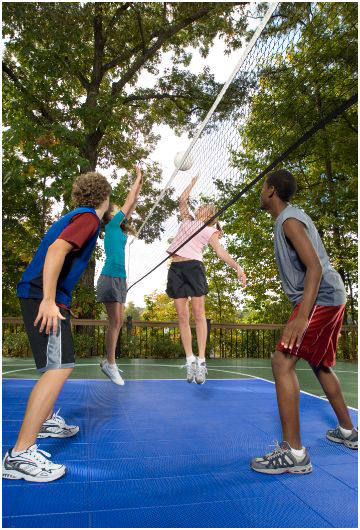 Contribute to your child's health and education by installing a court from Sport Court at your home!